Indiana may be marked by vast stretches of cornfields, but there’s something else Hoosiers have claimed when it comes to state cuisine: the pork tenderloin sandwich. Road trips to, and through, the state wouldn’t be complete without a stop for one of these massive works of culinary art. Anyone who takes a bite of a tenderloin sandwich will notice its similarity to wiener schnitzel, the breaded cut of meat we associate with Austria and Germany. Legend has it, German immigrants in Indiana were the first to kick off the sandwich version about a hundred years ago. Many Hoosiers trace its origins back to Huntington, Indiana, when Nick Freienstein threw pork wiener schnitzel on a bun and added a few toppings. The idea proved successful from the sandwich cart he operated, and he eventually opened a restaurant that still serves the sandwiches to customers (aptly named Nick’s Kitchen). Today, you can find riffs on the tenderloin sandwich all over the Midwest, but Indiana claims the fame for their pork-only, deep fried, oversized sandwich. And most Hoosiers you ask will have a strong opinion on which places serve the best versions (and maybe the worst). The concept seems simple enough: a tenderloin on a bun. But any good Hoosier knows there’s a lot more to it than that. First, the meat. It’s the star of the show, and begins with center cut boneless pork loin pounded thin (about a quarter of an inch) until it reaches an impressive circumference. Next, it gets dunked in an egg and milk mixture, then flour, and finally crushed crackers before being deep fried to crispy, crackly, golden perfection. Finally, the enormous pork patty gets stuffed inside a bun, along with a slew of toppings—typically onions, pickles, mayo, and mustard. If done correctly, the tenderloin outsizes the bun by a sizable margin, creating a delicious dilemma about how to approach the first bite. Some handle this with a knife and fork; some just pick the whole thing up and start chomping. 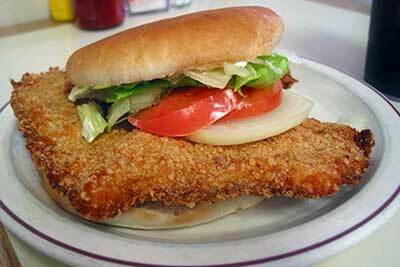 The pork tenderloin sandwich is on literally hundreds of menus across the state of Indiana…so where to stop? For true tenderloin historians and purists, Nick’s Kitchen in Huntington is a must. Considering the stories that swirl about it’s status as “the original,” it’s well worth the visit. The Mug in Greenfield was recently voted one of the best in the state when it comes tenderloins, serving fresh “farm to curb” (it’s a drive-in) fare. And when in Indianapolis, urban-dwellers will point you toward The Aristocrat, a pub-style eatery just north of downtown.